I've said before that sailing and boatbuilding are both pursuits that require you to know a million different small skills. 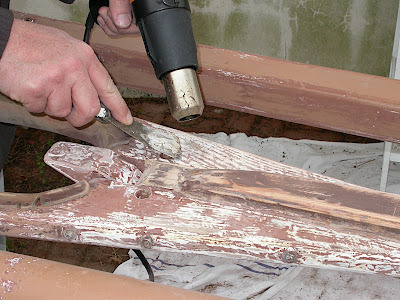 One boatbuilding skill that I haven't had a chance to practice much before is metal working. I've been spending the spring reworking all my running rigging (the lines that control the sails) so that it's both convenient to use, and extremely robust. 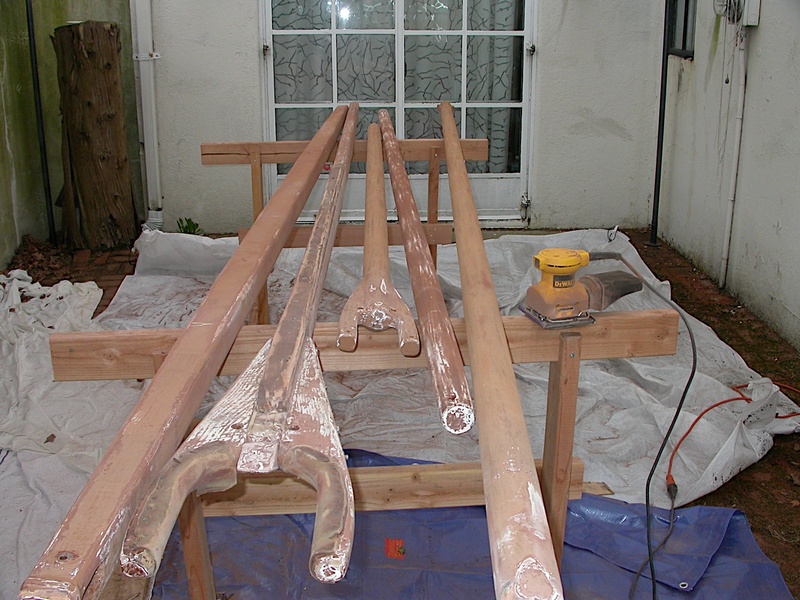 I've also been doing a bit of archeology on my spars to uncover evidence of how the Blue Moon was originally built & rigged. I've had my spars off the boat all spring and been working on them, so I've had lots of time to get up close and personal with them. It's amazing how much information you can learn about a boat's builder -- and subsequent owners -- by doing a little 'digging'. I assumed this because both the main and mizzen booms are a darker brown color (bottom spar in photo above), and the paint on those spars is in the worst shape. Because of the way the paint has worn on the booms, it looks like the color underneath is that beige color. Thus, my assumption that someone, for some reason, had slapped some dark brown paint over the beige. Wrong-O. Under the beige paint was that brown paint, and under the brown paint was a very hard white epoxy paint. It was that white epoxy paint that killed my varnishing plans. Last weekend, I borrowed a heat gun to see if heat and a scraper could remove the paint that had thwarted my miracle paint remover. The heat gun did remove both the beige and brown paint, and pretty briskly, too, but had no impact on the white epoxy paint, underneath. In the photo, it looks like I'm down to bare wood. It looks like you can see the grain in the wood. But in fact, what you are seeing is the surface of the thin white epoxy paint, which is rippled over the grain. There is still brown paint down in the 'valleys' of the ripples. I say that heat had little or no effect on the epoxy, but really, I didn't push it as far as I might have. In one test spot, I left the gun on one spot for a bit, until the wood under the epoxy turned black -- I could see it visibly darken under the thin coat of paint. When I saw that, I gave up on the whole idea of varnishing. Instead, I decided to give the spars a good clean up, fill in all the screw holes, sand and scrape them smooth, and give them a couple coats of good Kirby paint. I took all the hardware off, except for the gaff leather. That is held on with copper tacks, and I'm afraid if I take it off, it will be difficult to tack it back on again, since I'll have to reuse the tack holes. I worry that the tacks won't hold as well as they are now. There must be a solution to this problem, but it has defeated me for the moment. If you know how to remove the leather without causing a bunch of problems, please share your knowledge below in the comments section. I learned a lot about the Blue Moon's builder and subsequent owners from removing the outhaul sheave on the main boom. It literally took me 30 seconds to remove the sheave. Then why, oh why, did a previous owner leave it in when he painted the spar beige? I admire the determined way the painter jammed his paint brush down the hole, trying to get paint in there, but wouldn't it have been easier/neater to just remove the sheave? The sheave is an interesting one. It's galvanized iron with bronze rollers inside. They are crudded up from not being cleaned since 1996, but after a night's soak in kerosene and a good oiling, they are running and looking fine. It was while removing this sheave that I had my metalworking brain storm. I'd been wondering how to attach a topping lift to the end of the main boom. Again, there is no fitting for this line, and as far as I can tell, there never was. But a topping lift is practically mandatory for a big gaff mainsail. I don't know how you'd manage the sail without one. Actually, I don't need to imagine it, because I struggled without a topping lift for about 5 days, back in north-west Florida. Then I just tied the darn thing around the end of the boom and said, that will do! And it did, for about 1500 miles, but it was really in the way of the rest of the rigging. I needed a better, stronger attachment point. But what? Finally, it hit me. 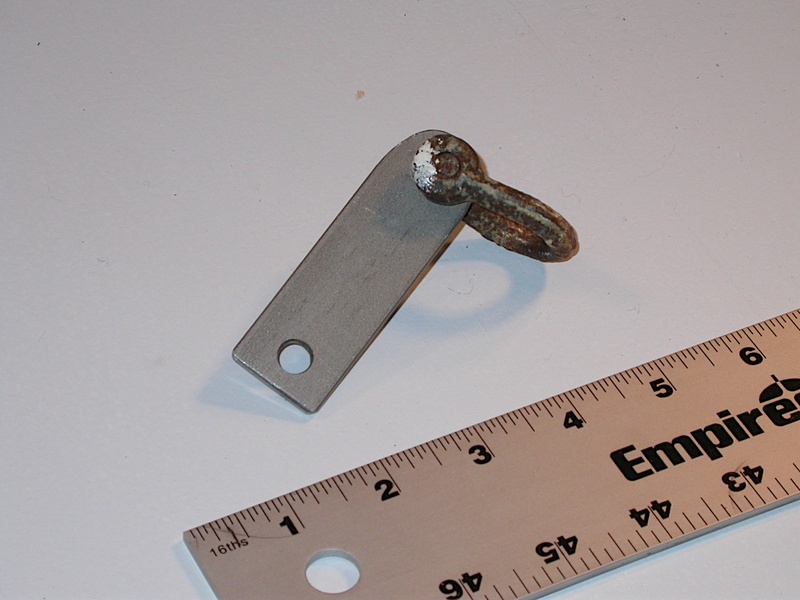 A stainless steel tang bolted to the end of the mast, using the outhaul sheave axle bolt! 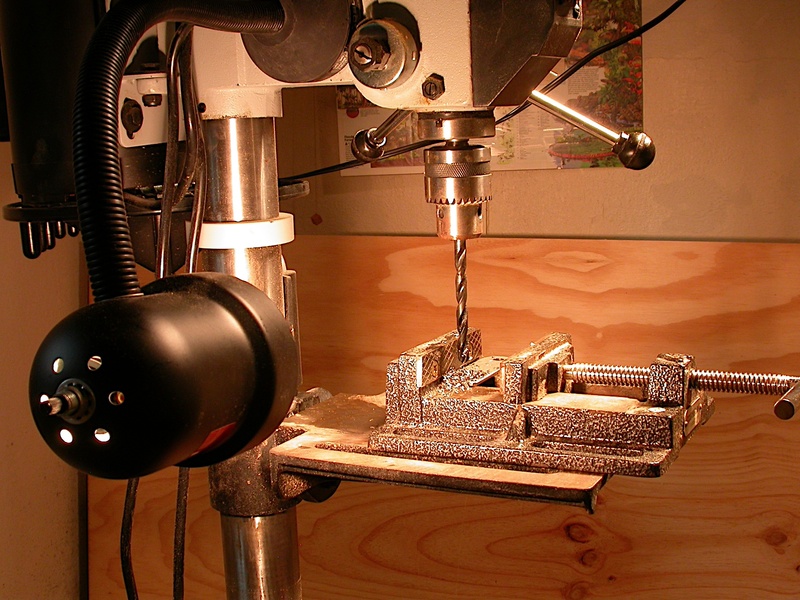 I happened to have some 1/8" SS bar that I bought to make steel-stropped wooden blocks, and I have my new Delta drill press ($75 on eBay -- whoo-whoo! ), that I also bought for my block-making project. With a hacksaw, a few files, and a bit of oil for drilling, I was all set. I've discovered all sorts of uses for this drill press, including turning wooden sheaves (more on that in a later blog post), but it's really essential for making holes in SS. I've tried it with a hand-held drill, and it just doesn't work. Anyway, in short order, I had a quite usable tang, nicely rounded and smoothed so it won't catch or tear anything. 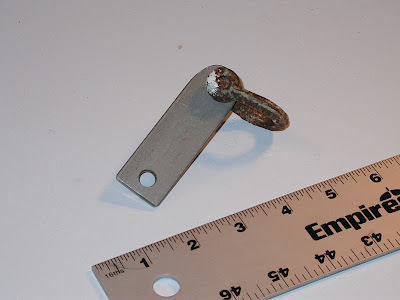 Topping-lift tang with shackle attached. 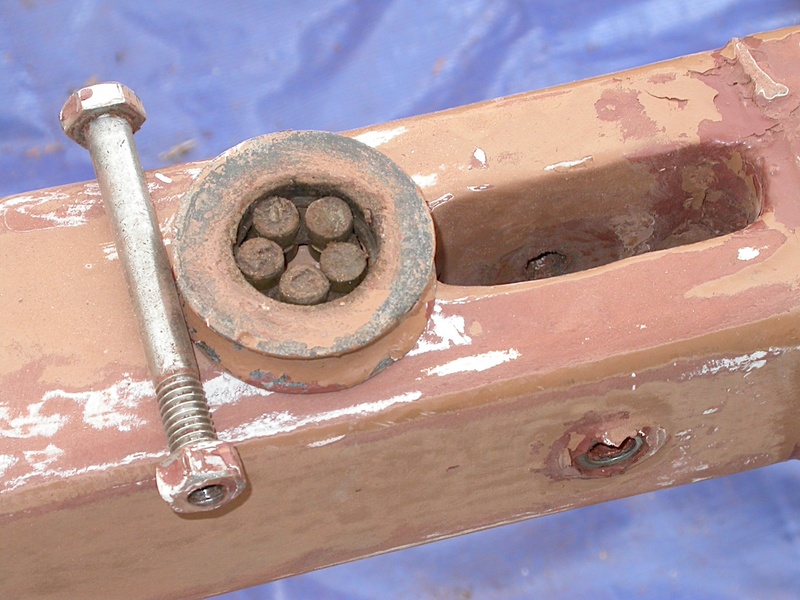 The sheave bolt will go through the bottom hole, attaching it to the side of the mast, out of the way of the outhaul line, and the topping lift will clip on to the shackle. So there you have it. A perfect solution with a few tools, a couple inches of material, and some elbow grease. And another check on my boatbuilder's skill list. No one else will even notice this little fitting, but every time I top up the end of my boom, I will smile just a little bit. >>> Next Episode: Department of Duh! I've been a long time reader and really enjoyed your journey up the east coast. I own a small gaff rig myself and was wondering how you use the topping lift. I use the main halyard as a topping lift when I'm at anchor to get the boom out the way but how do you make use of it underway? On the BM it would be a pain to use one of the halyards (i guess the throat) as a topping lift. The boom, gaff and sail are too big to be rolling around loose in the cockpit. Much better to have a dedicated topping lift. Just lower the gaff til it's a few inches above the boom, tidy up the sail, and tie off with my heavy duty gaskets (see "Gasket Envy". But the main reason is reefing. I don't know how you would reef the BM without a topping lift. Lots of people never reef, but I had to many times on my voyage. Finally, in light wind sailing, the weight of the boom can take all the twist out of the sail, which is bad. If the topping lift is on the weather side, you can top up the boom just enough to let the gaff twist off a bit. You don't want to do this with the TL on the lee side, for obvious reasons. That's why some boats have two topping lifts. John: The more I read you the more I wish I had stuck around at the State Marina that day. Not removing the sheave before painting reminds me of people who paint over window sash locks and light switch plates! Why? Baydog: You back in the water, yet? I'm hoping to go for a sail sometime next week... fingers crossed. Alan: thanks! What are you building? Not that I need any more ideas, but I've always been interested in folding/nesting dinghies. I also wondered if Cabin Boy would float, but it never leaked a drop. The big secret is, it's not as hard as you think, and the more home-made it looks, the more nautical it looks. As I may have said once or twice, if I can do it, anyone can. H'mmm... do I really need another project? Will have to think about this. Allan: cool! Hard dingys are the way to go, IMHO. And 10' is a good size. If I have any complaint about Cabin Boy, its that he's a little too small for two people. Vintage will be a big improvement, though its looking she won't see the water until next spring... too much to do on the BM to make much progress. John: We'll launch on Good Friday and hope the weather is good. This is a fascinating blog. I do hope you write that book. Also, I'm going to be trying to build the Vintage this summer, so I'm interested to see how you get on. I used to work on some tallships, and we'd replace the throat leather whenever we took the spar off (which was, admittedly, not that often). I believe the thinking was that it had less to do with the leather, though that was important, than it was to check underneath for wood rot. Anyway, I had to do it a couple times and it was dead easy. Use the old leather as a pattern, and and tack it on, being liberal with some sort of bedding compound to keep the water out. Sean: I've had to sideline my Vintage project to get the Blue Moon ready for spring, so you may well be ahead of me. If you need help on the lofting, I've got that very complicated job all done. I got some very valuable help from the man -- Greg Rossel -- which finally made things clear to me. I now officially 'get' lofting. I think you've given me the one reason I need to take that leather off: checking for rot underneath. I never thought of that, but now that you've raised the issue, I must see what's under there. If you'd like to 'guest blog' occasionally, about your Vintage build, let me know. A lot of people would be interested in the build, including me! It's the little things that make us happy.